Hi. I cannot find a reason why the messages are showing twice. Please go to this page for an example. It's like that for all feedback messages. Please switch to a default theme of WordPress. After switching to a default theme if the problem remain then let me know. Please also disable all of your plugin except Wp user frontend pro. Okay, so have tested with disabling all plugins and then activating them one after another. When all were deactivated the problem disappeared. When activating the WordPress SEO plugin by Yoast, then problem appeared. Do you have any input on this? Obviously we must use this plugin. If there is any issue in our plugin then we can fix it easily. Though it is a third party plugin so it is not easy to provide support for that. We do not provide support for any third party plugin. But we can try to solve this. If this take little bit of code then we will do that for you. but if this need huge customizing then we will inform about it. Please provide your login details and admin by using this form: http://wedevs.com/provide-login-details/. I will have a look what is going wrong. So I assume that you have not encountered this issue before? On the live site it will not be possible to disable any themes or plugins, as it will not function as intended. Will you be able to debug anything under these circumstances? We did not get any conflict like this. I did not tell you to disable your plugin. Please read my post clearly. We do not provide support for third party plugin. But i also said you can provide us the details. We will check and if we can then we will fix this ( if there is no major issue). I have now found some information about this issue. I don't think it's the WordPress SEO plugin that is the root cause of the problem. 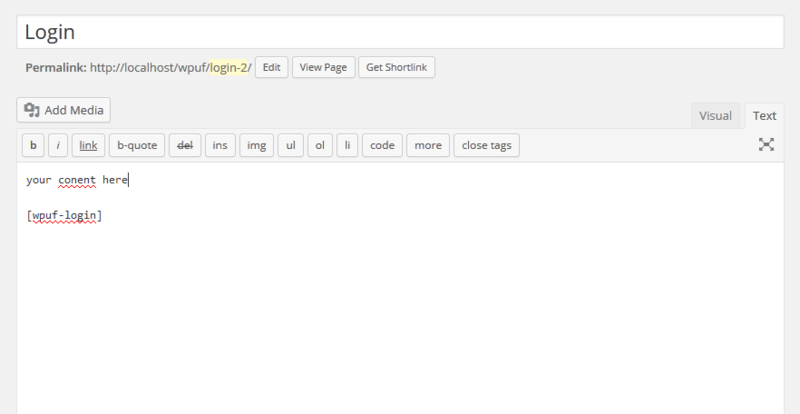 I have then removed the shortcode from the content edit area under pages. I have done this, so I can place other content in that page, that is shown when the user is logged in. Do you know why it display all messages twice based off of this information? Your code seems like ok. Did you insert that shortcode anywhere in the front page twice?. Actually you have customized our plugin. So we can not provide support for this. We only provide support for our built in feature, installation and configuration. Hi, no did not add it twice, but maybe WordPress SEO plugin does something, so it adds it twice? If I cannot do it this way, how can I then display only the login form on the page, but when I am logged in, then display other content? In the page just write the content and the shortcode then the content will appear in the login page. I think there is no need to insert any code to show the content in the login page of WPUF. Thanks, but I don' know if you saw my screenshot? I want the body text to be shown only when the user is logged in. So for instance in your example. The text you wrote “your content here”, should only be shown when the user is logged in. How can I do this? I think you can use this plugin to show content after login and more function- https://wordpress.org/plugins/restrict-content/.